When you arrive, you may be greeted by one of the family’s dogs: a very sweet husky, or an elderly hound mix. Then you’ll make your way over to a farm stand where you can select from one of several basket sizes to pick your apples. The smallest is $5, and the largest is $25. You can also borrow a wheelbarrow to carry more than one basket. 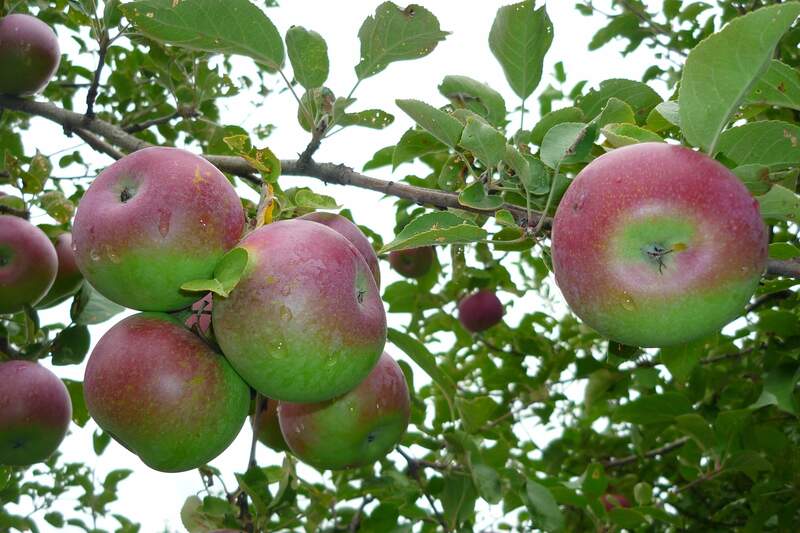 When picking, you can fill your basket with any varieties of apples that take your fancy. Paul Doran told us to eat as many as we like, and then pick our favourites. I felt a bit guilty sampling so many apples, but I have to say that it made the experience really fun, and I would gladly have paid more money for the apples we did purchase. The Doran family also used to make and sell wine under the label Chateau Bourget. However, Paul says that they got out of that business because “it simply doesn’t pay”. Instead, he focuses on the pick-your-own apple business, and it’s obvious that he really enjoys it. Pine Hill Orchards is one of those small, family-run businesses that makes Ottawa such a great place for agritourism. We felt so welcome, picking our apples in the orchard amidst other families, on a quiet Saturday afternoon in the fall. Oh, and the apples were delicious too! Tours: Pine Hill Orchards offers school and classroom tours. The tour includes a wagon ride, apple picking, fresh cider, and other activities. To read about other orchards in the Ottawa region, please see my blog entry from last year, located here.